Update: State Department Spokeswoman Marie Harf reacted to the IPT's story by posting on Twitter: "FALSE. I addressed on the record in briefing. Said is abhorrent and insulting to millions who died in the Holocaust." QUESTION: -- on the Holocaust. MS. HARF: Yes. Well – and we have seen them. Unfortunately, these statements are nothing new. We have heard these before and obviously would strongly condemn any anti-Semitic statements. They're inflammatory. They're, quite frankly, abhorrent. And it's insulting to the millions of people who died in the Holocaust. You heard the President reference the Holocaust today when he talked about what Europe had gone through in their own fight for freedom. And these kinds of comments are, as I said, abhorrent. I don't know what else to call them, how I could be stronger in condemning them. The State Department has not criticized a statement denying the Holocaust made March 20 by Iran's Ayatollah Ali Khamenei despite President Obama's promises to "speak truth" to Holocaust deniers. "The Holocaust is an event whose reality is uncertain and, if it happened, it's uncertain how it happened," Khamenei said in a speech commemorating Nowruz, the Persian New Year, the International Herald Tribune reported. "In Europe no one dares to speak of the Holocaust. 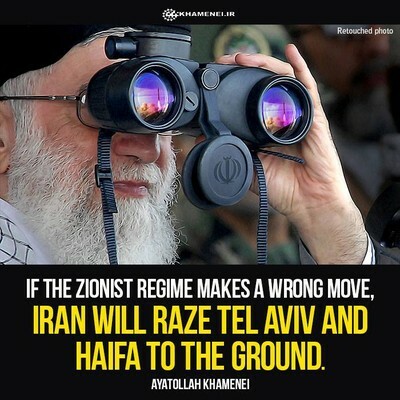 That same day, Khamenei also vowed to "raze Tel Aviv and Haifa to the ground" if "the Zionist regime makes a wrong move" in a post on his official Facebook page. A reporter asked State Department spokeswoman Jen Psaki at last Friday's press briefing if she had any comments about the ayatollah's remarks, which were described as "not very kind either to the United States or to Israel, to put it mildly." She said she didn't know about the specifics and would check into it. Told that the ayatollah "again voiced doubts about the existence and the scale of the Holocaust," Psaki pledged to "take a closer look and we can get something around to all of you." No statement has been made by the State Department or the White House since then. The Investigative Project on Terrorism asked State Department spokesman Peter Velasco Tuesday afternoon if, having had time to review Khamenei's remarks, they had any comment. Velasco said no, and asked that further questions be referred to the State Department's press duty officer's email. An email was sent, but no reply has been issued. Iran's highest ranking religious and political figure has routinely used his Facebook page to promote hatred against Jews by comparing Zionists with Nazis and to exalt Palestinian terrorist groups. Khamenei's incendiary comments contrast with goodwill messages President Obama and Secretary of State John Kerry sent to Iranians to recognize their new year called Nowruz in Farsi. "If Iran seizes the moment, this Nowruz could mark not just the beginning of a new year, but a new chapter in the history of Iran and its role in the world – including a better relationship with the United States and the American people, rooted in mutual interest and respect," Obama said in a video message to the Iranian people. On Friday, Kerry similarly suggested that the Iranian holiday could mark a time of "renewal and hope" and used his Nowruz message to announce that the State Department was issuing a new "General License" to allow more Iranian students to study in the U.S. The State Department silence over Iran's most recent Holocaust denial stands in stark contrast with Obama's repeated pledge to strongly respond to the anti-Semitic revisionism. The United States would "pledge to speak truth to those who deny the Holocaust," Obama pledged in a January 2012 message commemorating International Holocaust Remembrance Day. He directly addressed Holocaust denials coming from Tehran in an April 2012 speech at the United States Holocaust Memorial Museum, condemning Iran for denying the Holocaust and threatening to destroy Israel. State Department officials issued similar condemnations of former Iranian President Mhmoud Ahmadinejad's Holocaust denials since Obama came to office. The administration has been sensitive about moves that might disrupt ongoing negotiations aimed at stopping Iran's nuclear program. That apparently means passing on a golden opportunity to make good on the president's vow to "speak truth" to those who deny the Holocaust. John Rossomando is a senior investigative reporter at the Investigative Project on Terrorism. Steven Emerson is the IPT's executive director.